Dublin got their EirGrid Leinster U21FC off to a winning start in Wednesday night's quarter-final at O'Moore Park, Portlaoise. The Dubs put in a storming last 25 minutes to come from a point in arrears to run out convincing winners by the finish line after a tough battle with Shane Carthy's injury-time goal putting the final gloss on proceedings. Dessie Farrell's side had led by three points, 1-11 to 2-5, at half-time and it could have been more as both Colm Basquel and Killian O'Gara struck the woodwork with goal attempts while Basquel, who had a lively first half, was also denied by Laois keeper Adam O'Reilly in the seventh minute. However, on the restart Laois took control of the game and driven on by Evan O'Carroll kicked four points inside the opening five minutes of the second half to take the lead for the first time in the game, 2-9 to 1-11. 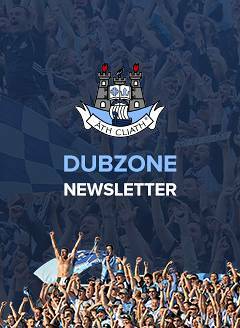 But Dublin soon seized back the initiative with the likes of Eric Lowndes and Niall Scully to the fore while the introduction of sub Daithí Ó Cathmhaoil curbed the influence of O'Carroll who was operating at midfield. From then to the end Dublin outscored their hosts 1-10 to 0-1 to set up a semi-final against Longford on Wednesday, March 18. The influential Scully slotted a free to start Dublin's fightback, before Laois kicked three bad wides, while points quickly followed from the impressive Killian O'Gara, two from Conor McHugh and an excellent Lowndes point after a surging run through the heart of the Laois defence. Further points from wing-back Eoin Murchan and two more from the clinical McHugh (one free) pushed Dublin 1-19 to 2-9 clear by the 54th minute. 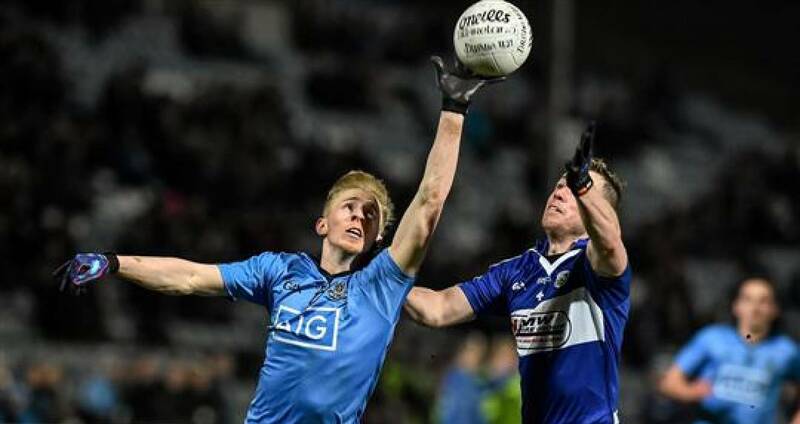 In the final minutes sub Niall Walsh and McHugh tagged on points before Ó Cathmhaoil and Gavin Burke combined for Carthy to unleash a ferocious shot to the roof of the Laois net and help Dublin run out 11 point victors. If Dublin finished the game with a flourish they also started that way as early points from Carthy, Michael Deegan (two), Scully and O'Gara had the Dubs 0-5 to 0-0 to the good inside just six minutes. O'Gara's 12th minute goal following a great pass from Lowndes had Dublin 1-5 to 0-2 in front but Laois struck for two goals of the own before the interval as they punished turnovers with Alan Farrell and Tom Sheil both raising green flags. SCORERS - Dublin: C McHugh 0-6 (0-1f), K O'Gara 1-3, N Scully 0-4 (0-2f), S Carthy 1-1, M Deegan, C Basquel 0-2 each, E Lowndes, E Murchan, N Walsh 0-1 each. Laois: T Sheil 1-3 (0-3f), A Farrell 1-0, E O'Carroll 0-3, P Kingston 0-2, E Keane, D O'Reilly 0-1 each. DUBLIN: L Molloy; E Mullan, D Byrne, R McGowan; E Lowndes, C Mulally, E Murchan; Stephen Cunningham, S Carthy; R Gaughan, M Deegan, N Scully; K O'Gara, C McHugh, C Basquel. Subs: N Walsh for Gaughan (ht), D Ó Cathmhaoil for Stephen Cunningham (36), S Clayton for Deegan (37), G Burke for Basquel (51), Shane Cunningham for Scully (bc, 57), A Byrne for O’Gara (60). LAOIS: A O'Reilly, L Knowles, K Lennon, C Dunne; P O'Sullivan, C Hogan, D O'Reilly; E O'Carroll, P Kingston; N Murphy, J Moore, A Farrell; T Sheil, E Lowry, E Keane. Subs: N Mullen for Murphy (ht), R C Fennell for Dunne (50), C Maher for Keane (53), D Hickey for Farrell (56), E Buggie for Hogan (61).